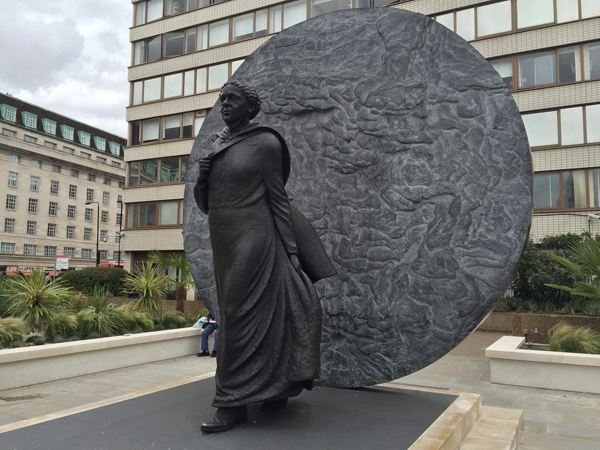 Immortalised in a statue in the grounds of St Thomas’ Hospital on South Bank last year, Mary Seacole is the first named black woman to have a memorial statue made in her image in London. Mary Jane Seacole (nee Grant) was born in Kingston, Jamaica, in 1805, the daughter of a Scottish army lieutenant, James Grant, and a mixed-race Jamaican woman who kept a boarding house for invalid soldiers. She was taught traditional medicine by her mother from a young age and travelled extensively, visiting other parts of the Caribbean including Cuba and Haiti as well as Britain – staying in London for about a year around 1821, during which she added to her knowledge of medicine. In 1836, she married merchant Edwin Seacole (he was the godson of Vice-Admiral Horatio Nelson – some rumours have it that he was actually his illegitimate son) but he died only eight years later in 1844. She subsequently spent some time in Central America – opening a ‘hotel’ there and aiding in the response to an outbreak of yellow fever – before returning to Jamaica where she apparently provided nursing services at the British Army HQ in Kingston. In 1854, Seacole returned to England and, amid reports of the hardships soldiers were facing in the Crimean War which had broken out the year before, asked the War Office to send her to the Crimea as an army nurse. She was refused on multiple occasions (some say because of her race; others because she was too late to join the teams of nurses that were sent) and so she headed to Crimea herself. There, she founded the British Hotel near Balaclava which provided food, quarters and medical care for sick and convalescent officers. She also apparently rode out to the front line of battle where she cared for the sick and wounded and such was her fame that Mary became known as ‘Mother Seacole’, earning a reputation said to rival that of Florence Nightingale. Seacole returned to England after the war in ill health and poverty and apparently such was her renown that a benefit festival was held in her honour in July, 1857, to raise funds for her to live on. That same year she published her memoir, The Wonderful Adventures of Mrs Seacole in Many Lands. Seacole returned to Jamaica in the early 1860s but was back in London by 1870. 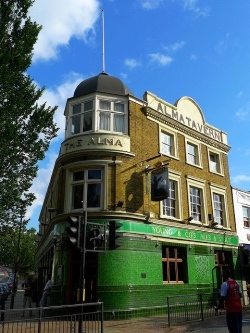 She died at her home in Paddington of ‘apoplexy’ on 14th May, 1881, and was buried in Kensal Green. In 2004, Seacole was ranked the greatest Black Briton in an online poll. She has also been honoured with an English Heritage Blue Plaque (located on her one-time residence at 14 Soho Square) and a City of Westminster Green Plaque in George Street on the Portman Estate. The three metre high bronze statue of Mary, built through funds raised in a public appeal and installed using money granted by the government, is the work of sculptor Martin Jennings. It was unveiled by actress Baroness Floella Benjamin in June last year before a reported crowd of some 300. Seacole remains somewhat of a controversial figure with some saying her recent fame has unfairly come at the expense of contemporary Florence Nightingale. • Comic Kenneth Williams (1926-1988) has been honoured with an English Heritage Blue Plaque at the London apartment he lived in during the hey day of the ‘Carry On’ series of films during the 1960s. Williams lived in flat 62 on the top floor of Farley Court, located between Madame Tussauds and Baker Street station, between 1963 and 1970 during which he starred in such films as Carry on Cleo and Carry on up the Khyber and also appeared in radio comedy programmes such as Round the Horne and Just a Minute. For more, see www.english-heritage.org.uk/discover/blue-plaques/. • Two exhibitions celebrating London’s Frost Fairs are underway at the Museum of London and its Docklands sister. Frozen Thames: Frost Fair 1814 at the Museum of London in the City and Frozen Thames: Frost Fair 1684 at the Museum of London Docklands both feature objects, paintings, keepsakes, engravings and etchings from the museum’s collection. Highlights at the Museum of London exhibition include the only surviving piece of gingerbread from the 1814 fair, the last fair of its kind, as well as etchings by satirical artist George Cruikshank and a print by George Thompson while among the items on display at the Docklands museum are two paintings by a Dutch artist Abraham Hondius (c. 1625-91). Both exhibitions are free and both run until 30th March. For more, see www.museumoflondon.org.uk. 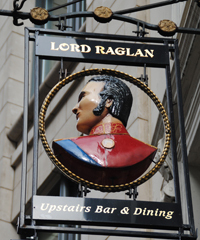 Originally known as The Bush, The Lord Raglan pub just to the north of St Paul’s was renamed in the mid 1800s to commemorate one of the heroes of the Battle of Waterloo – the 1st Baron Raglan (1788-1855). Named the 1st Baron Raglan in 1852, the man previously known as Lord FitzRoy Somerset had lost his right arm at the Battle of Waterloo, fought between the Duke of Wellington and Napoleon on 18th June, 1815, in modern-day Belgium. His name was subsequently adopted to to describe the ‘Raglan Sleeve’, a type of sleeve which extends as a single piece to the collar and a style which Lord Raglan was said to have favored after his arm was amputated. Lord Raglan died in 1855 while Commander-in-Chief at the Crimean War. There is a blue plaque commemorating his role in this war on his former house in Stanhope Gate in Mayfair. The site of the Lord Raglan tavern, 61 St Martin’s Le Grand, is said to be one of the oldest tavern sites in the city, originally dating from about 1779, and while the current building dates from 1855, the cellars are said to be much older and are said to incorporate parts of what was the Roman wall. For more on the Lord Raglan, see the Taylor Walker website at www.taylor-walker.co.uk/pub/lord-raglan-st-pauls/c1779/. Known as “The Lady with the Lamp”, Florence Nightingale is remembered for her contribution to the development of the profession of nursing and the reform of medical practices during the Crimean War and the latter half of the 19th century. Born on 12th May, 1820 in Florence (it’s from her birthplace that she gets her name), Florence Nightingale was the second daughter of William Edward Nightingale, son of a wealthy Sheffield banker, and Frances Smith. She had a relatively privileged childhood at her family’s homes of Lea Hurst in Derbyshire and Embley Park in Hampshire (her father was named High Sheriff of the county in 1828) as well as occasional visits to London and received a broad education. Believing herself to be called by God into His service when in her mid-teens, she chafed at the life set before her. It was a during visit to convent which holidaying in Rome with family friends that she became convinced she had a mission from God to tend to the sick. This was only furthered during a subsequent visit to a religious community at Kaiserswerth am Rhein – a training school for nurses – that finally convinced her of the possibility of making nursing a vocation for ladies. Returning to England, Nightingale took up her first official post – as superintendent of the Hospital for Invalid Gentlemen – in 1853. The Crimean War broke out in March, 1854, and later that year, aware of reports of the suffering sick and wounded English soldiers were enduring, Nightingale offered her services to the War Office following an invitation by the Secretary for War Sidney Herbert. Charged with authority over all the nurses (her official title was later Superintendent of the Female Nurses in the Hospitals in the East), Nightingale embarked for Crimea on 21st October with 38 nurses (there’s a plaque at 90 Harley Street – site of the hospital from which Nightingale left for the Crimea). She reached Scutari in Turkey on 4th November, the night before the Battle of Inkerman. Headquartered in Scutari, Nightingale set about organising the military hospitals, improving general hygiene and conditions and supplies of essentials like clothes and other equipment. The wounded men soon recognised her efforts and began calling her ‘The Lady of the Lamp’ – referring to sight of her checking the wards at night. Visiting hospitals near and in Balaclava in 1855, Nightingale fell ill from “Crimean fever” but recovered and was able to return to Scutari and continue her work. The following March Nighingale returned to Balaclava and continued to work there until the hospitals closed in July. She returned to England and the family home at Lea Hurst the following month. In September, 1856, Nightingale had an audience with Queen Victoria at Balmoral – she used the occasion to inform the Queen and Prince Albert of the reforms needed in the military hospital system (and subsequently met with the Queen many times). Backed by data she had collected in the Crimea, Nightingale also pushed for a commission into military hospitals – it was commenced in April 1857 and Nightingale’s written evidence was critical to its recommendations. In 1860, the Nightingale School and Home for Nurses was established at St Thomas’ Hospital in London (it was funded with £50,000 raised through the Nightingale Fund which had been established in 1855). She as unable to take up the post of superintendent due to ill health and other reasons but continued to take an active interest. Nightingale – who wrote more than 200 books, reports and pamphlets on hospital planning and organisation, including the famous Notes on Nursing (1859), and interestingly is also said to have invented the pie chart – was also involved in establishing the East London Nursing Society (1868), the Workhouse Nursing Association and National Society for Providing Trained Nurses for the Poor (1874) and the Queen’s Jubilee Nursing Institute (1890). Her accolades included the German Order of the Cross of Merit and the French Gold Medal of Secours aux Blessés Militaires and the badge of honour of the Norwegian Red Cross Society. She was the first woman to be awarded the Order of Merit and the Freedom of the City of London. Nightingale died at the age of 90 in South Street London (just off Park Lane – there’s a Blue Plaque marking the spot), on 13th August, 1910. She was buried in the family plot at East Wellow, Hampshire. There is a memorial to Nightingale as part of the Crimean War Memorial at Waterloo Place and a chapel dedicated to her at Westminster Abbey which is involved in the annual service commemorating her held there on her birthday, International Nurses Day, every year. For more on the service, see our earlier post here. 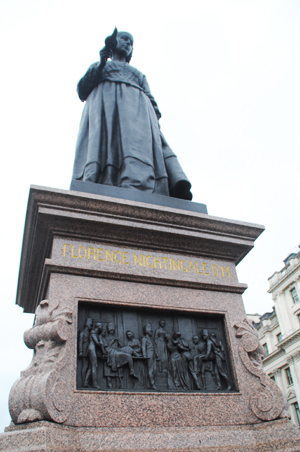 Well worth a visit is the Florence Nightingale Museum, located within St Thomas’ Hospital. Highlights include her pet Owl Athena and the Turkish lantern she used in the Crimean War and the museum archives include around 800 letters from Florence Nightingale. For more on the museum, see www.florence-nightingale.co.uk. 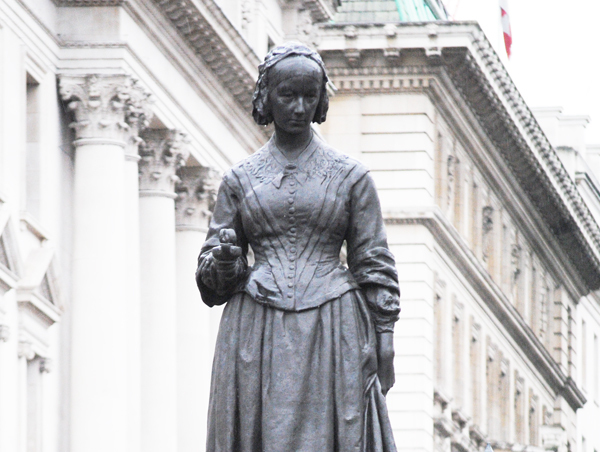 The life of Florence Nightingale, ‘The Lady with the Lamp’, depicted here on the Crimean War Memorial at Waterloo Place, is to be commemorated at the annual service in Westminster Abbey tomorrow. The Florence Nightingale commemoration service is held “to celebrate nursing and midwifery and all staff, both qualified and unqualified working in these services”. During the service a lamp, carried this year by Claire Gibbs, will be taken from the Abbey’s Florence Nightingale Chapel (formerly known as the Nurses’ chapel but rededicated in May 2010 – the centenary of Nightingale’s death) and escorted by a procession of nurses – this year it’s students from Liverpool John Moores University – to Reverend Professor Vernon White who will place it upon the High Altar. The address will be given by the former Archbishop of Canterbury, Lord Carey. Nightingale (1820-1910) rose to fame for her pioneering nursing work during the Crimean War and established the first secular nursing school in the world at St Thomas’ Hospital in London. The upcoming International Nurses Day is celebrated each year on her birthday – 12th May. Tickets for this year’s commemoration service are already allocated – to apply for tickets to next year’s, keep an eye on www.florence-nightingale-foundation.org.uk for details.